So … I guess it could have been worse? Still, a bad day all around. As a lifelong Red Sox fan I feel for ya – but when you finally find paydirt, and you will, the reward will be beyond what fans of the Yankees & Lakers ever experience. You missed the day Indians pitchers Steve Olin and Tim Crews died on Little Lake Nelly during Spring Training in Florida. Just a heart-wrenching day that shaped the franchise for the entire 1993 season. That should be a solid #2 on your list. Somewhere in a chilly, drizzly town, a Sonics fan smiles. The NBA’s Art Modell lives in OKC. 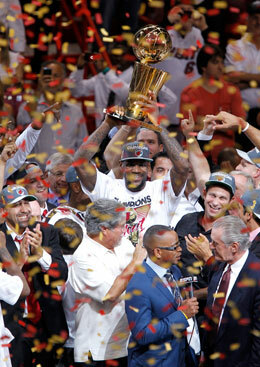 I will always dislike Lebron, but I just don’t feel anything about them winning the championship. I would have never guessed I’d feel this way before it happened, but the trophy and any that follow just aren’t relevant in regard to how I feel about the guy. What happens on draft day is a whole lot more important to me and ohh yeah I still dislike Lebron. Martina Hingis’ observation about “loose points” is right on the money. To take a more recent and more publicized example, that’s Tiger’s problem now. Yes, Tiger could (and did, frequently) make ridiculously difficult and wonderful shots. But what made him the winner so many times, especially in majors, was his ability to not have *any* “loose points”. To name just two examples, in his first major win, the 1997 Masters, he had exactly *zero* 3-putts; in the 2000 British Open, he did not hit a single ball into a bunker in 72 holes. Given that the greens at Augusta are famous for their difficulty, and that there are 112 bunkers at St. Andrew’s, that’s quite astonishing. Problem now is he has those “loose points” just like any other pro. Hard to hate the guy any more than I all ready did, but I do. I guess I have the King’s permission to go back to my miserable little life. I’d point out that LeBron never, ever said that his haters had “miserable” lives, but I fear that truth and facts would be lost on one such as Chuck. If you cant see to allow him to paraphrase, you are way too literal. There’s a long way from what James said to Chuck’s ‘paraphrase’. This is much closer to Seinfeld’s line that we root for laundry. That statement is actually really humble for an NBA player; what other NBA player talks like that? People will see what they want to see: People who don’t like LeBron will be convinced that LeBron thought they had miserable lives, but to me, when I saw the quote, I knew exactly what he meant: Hating LeBron isn’t going to improve your life. If LeBron wanted to say “Your life stinks and mine doesn’t”, he simply would have said that. Of course I was paraphrasing drunyon. And you’re right, no NBA player – including LeBron – talks like that. So some spin-doctor got to LeBron and wrote an “explanation” for him. You can’t be so naïve as to believe that this was heartfelt. The post-game interview was LeBron’s own words. I sincerely doubt that his “apology” was his thoughts and his thoughts alone. You know what LeBron wants more than an MVP Trophy or and NBA Title? He wants to be admired. Well I can assure you that the one thing he’ll never be in his hometown – and I don’t give a damn how many trophies he collects – is admired. If what he wanted most was to be admired then he wouldn’t have left Cleveland. That’s actually what I admire about him (ironically), that he put winning ahead of getting people to like him. Was made up in yesterday’s post. Clemenate (KLEM-a-nayt), verb, to hate an athlete in an entirely healthy, fun sports way (rather than hating them in a crazed, stalking, loaded gun, insane sort of way). Actually, Joe coined this term a while back. See JoeWords link at the top of the page for more Joeisms. Oh my goodness, an SI convert for sure. Clemenate is long established. I’m rethinking LeBron a little. In short, what every fan and NBA pundit wants is that the Heat run an isolation play allowing LeBron to drive to the hoop. If he doesn’t drive, and takes a jumper, he’s shrinking from the moment ( only if he misses btw). This is more or less a standard offense in the NBA. The only difference other teams may have is if they have a great post player, in which case they run in isolation post up play. The rest of the players camp out beyond the 3pt line and wait ( hope!) for a kick out. Referee bias allows this very unappealing style of play to flourish. This is in contrast to the “motion” offenses that were prevalent pre 3pt line, where the worst shot you could take was the current NBA 3 pointer. I wonder if LeBron enjoyment of sharing the ball and setting up teammates would have worked much better in an earlier era. Even in the 80s, teams took far fewer 3pt shots since they still clung to the hoops theories that existed prior to the 3pt line. Joe, as a Raptors fan who held a grudge against TMac and Vince for several years, all that I can offer as counsel is to let this one go. I understand that comparing the loss of Lebron to Vince/TMac is like comparing the loss of $1000000 to $100, but outside of the Decision, there is no tangible difference between how the Heat and Thunder were constructed (or the Celts, or the Shaq-era Lakers), so I hope that you can eventually take a step back and just appreciate the best that basketball has to offer. I think it was the way he left, not that he left. 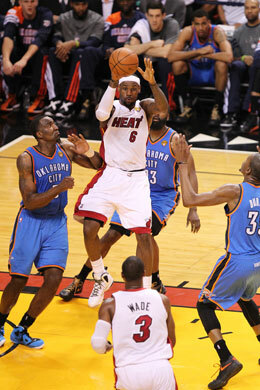 Any negative feeling for LeBron and his title quest was superseded by frustration over the Thunder play. I really didn’t follow them until the Finals, but that short stretch showed me they would drive me nuts if I were an every-game fan. Westbrook–has there ever been such an impressive player who negates almost all his positives with inevitable boneheaded plays? Does Kendrick Perkins provide anything other than an all-league sneer and borderline thuggery? If it weren’t for Kevin Durant, this group would easily surpass the King James entourage for unlikeability. I’d agree with you, except that James Harden is also extremely easy to like; he was basically the only player on either team who didn’t whine to the refs for a foul after every single missed shot. Westbrook is the most overrated player since Iverson. I was kind of rooting for him to win his title because, as much as I disliked the Decision and everything it said about James and the so-called “modern athlete”, I am even more sick and tired of the “only true measure of athletic greatness is rings” meme. I would rather see James’ greatness (and every other great player in the same boat) recognized without that bit of carping than fixate on his its-all-about-me-stabbing-of-Cleveland-dreams. As far as NBA offenses, the problem is that the average NBA player can’t defend the average NBA player one-on-one, and the best NBA players are nearly unstoppable with the ball in their hands; these guys are too strong and fast, and as JoePoz notes, can do remarkable things if left alone. Until that changes, the isolation play will always be a workable offense. James’ unselfishness makes him even better at that than your average player, perhaps the best I’ve seen since Magic. Anyone who can stop him from backing them down isn’t fast enough to stop him from driving, and he’s an excellent passer when the double-team comes. At times it seems his only limits are his balky three-point stroke, and that even he gets tired over 48 minutes a game, 82+ games a year … but he’s 27, at the peak of his game, and is starting to play fewer minutes during the regular season to keep fresh for the playoffs. Chuck, your comments yesterday and today make me think you must actually have a “miserable little life” to go back to. Maintaining so strong a grudge for a 27-year-old kid you probably never have and never will meet, and who plays basketball for a living, is absolute silliness. Root against him all you want, but, jesus, why so bitter? Joe, I’m inclined to believe you think the NBA is less interesting with Lebron having won a championship because you’re simply predisposed to disliking him and you’d like it to be zero-sum. Lebron James wins, NBA loses, and vice versa. That’s a shame, really, coming from a first-class sportswriter. I think the NBA just stumbled across the starting point of the next great long-term rivalry that will galvanize interest in the sport. And by the way, not to let the cart get too far in front of the horse, but nine-year veteran Lebron is a year younger than Michael Jordan was when he won his first title. A handful of rings is still not out of the question. Pro sports in general are silliness. Joe’s Pro Wrestling analogy is spot on. After all it’s just a bunch of over-grown man-children putting a round leather ball through a metal hoop ten feet off the ground. It’s not exactly treating the sick or housing the homeless. Joe makes a nice living writing about it. I don’t make or lose a nickel from any of it. And yes, we “fans” can appear to be overly invested in the players. Just like trekkies can be overly invested in the fictional capabilities of the “Enterprise” or soap opera fans can have strong feeling about fictional characters, or wrestling fans “hate” a particular “heel”. I think we all know the difference between what has meaning and what does not. Now here’s a Truth that occasionally gets lost in the focus on athletic performance: the players are people outside of the arena. Some are great people and great role models. Pat Tillman springs to mind. Some are despicable human beings – here I think of Ty Cobb. And some are just flawed like the rest of us. I’m thinking of the above referenced Roger Clemens. Great players can be horrible people. Because a player has great athletic skill does not mean he’s a great person. One has nothing to do with the other. To me James sits somewhere between Clemens and Cobb – closer to Cobb actually than Clemens. A gifted athlete without any socially redeeming qualities – Bike-a-Thons or not. So yeah, I get it. All of this activity orbits somewhere outside my real life. And now for me the NBA orbits a little bit further away. Comparison to 1972: Wilt Chamberlain and Jerry West finally won an NBA championship after 10 and 11 seasons, with Elgin Baylor (12 seasons) on the roster though not playing at the end. Also Gail Goodrich, Happy Hairston, Jim McMillian, Flynn Robinson, Pat Riley, Keith Erickson, Leroy Ellis. Comparison to 1992: Michael Jordan has Pippen (vs. Wade), Horace Grant (vs. Bosh). And true 7-foot centers Bill Cartwright (once an All-Star), Will Perdue. John Paxson and B. J. Armstrong instead of Chalmers and Cole. Comparable, but the advantage is to Jordan, I think. Finally, comparison to 2007: LeBron had Zydrunas, Larry Hughes, Drew Gooden, Sasha Pavlovic, Anderson Varejao, Donyell Marshall, Damon Jones, and Boobie Gibson. Try to put a stable rotation together out of that and win the finals. Just a small note, the 72 Lakers’ title was Chamberlain’s second, he’d won in Philadelphia in 1967. Thanks, NRJyzr. I shouldn’t have forgotten the ’67 ’76ers with Wilt, Luke Jackson, Chet Walker, Hal Greer, Wali Jones, and Billy Cunningham Dave Gambee, Larry Costello, among others, off the bench. 68 wins, the record until the 72 Lakers won 69. I’m a cavs fan as well as a James fan. I am very happy for him. He earned it. I love his game, because he plays the game the right way. He makes the right plays the majority of the time. All the hatred for him is so over the top and most of it is so deluded, it isn’t funny. And David in Toledo, you are spot on. He gave Cleveland all he had and the best teammate he ever had there was Mo Williams. Yes, Mo Williams. The fact that people expected James to do something that no other NBA superstar had ever done was ridiculous. Basketball is a team sport. Did he handle the “decision” in really bad taste? Of course, but even that is subjective. ON THE COURT, which is ideally the only way we are to judge these guys, he is the best in the NBA. You can’t be both. It’s the Law. How can a guy from Cleveland write such a laudatory post about LeBron James? Oh wait, I forgot, it’s Posnanski. The guy who thinks you can ignore child molestation, and yet still be a great hero. Can you please tell me where Posnanski said anything of the kind, about anyone? Give it a rest. You can take anyone’s hero and find warts. JoePa didn’t molest those kids (there’s a special place in hell for Mr. Sandusky), and he didn’t observe the molestations (Mr. McQueary, anyone?). A wart on his record? Of course. And I guess JoePa isn’t your hero. OK. It is possible to find a wart on anyone who is venerated. A guy with a track record like JoePa is going to be seen, defensibly, as a hero to some. That’s how heroes work. We take positives and put them up front. The negatives fade to the black. Some people are heroes for one selfless act in their lives. The NYPD and NYFD people who died on 9/11 come to mind. We hold them up as heroes because they gave their lives saving and trying to save others. We don’t go into their pasts and see whether there was something bad about them, so that we can take them off our “hero” lists. Is JoePa my hero? No. Mine is someone you’d probably also take issue with – he has warts, too. But JoePa is JoePoz’s hero, and he’s entitled to it. Uh, that’s a pretty big “wart” Joe Paterno has. It’s not like he didn’t pay his taxes for a year or blew .012 on a blood alcohol test or whatever. He–either through his action or his inaction–helped cover up and perpetuate child molestation, one of the most evil and harmful crimes. It’s rather offensive for you to imply that this is just a garden-variety shortcoming, and no big deal. Still waiting for your evidence that Posnanski has called Paterno a great hero after the accusations came to light. Yes, JoePoz certainly venerated JoePa as a hero in the past. But he has said nothing since the revelations and his book is yet to be published. But with his history, it is hard for me to imagine his take being anything less than a little tough, a little compassionate, and a lot fair. And b. Not give out the juice on what is sure to be a very profitable book for him. I would imagine Joe feels to have been in the worst place at the worst time as a person and fan, while also the best place at the best time as a journalist. The man was writing a book. He did not, at any point, work for or have direct involvement with the Penn State staff. He found out about it when we did. I think at some point, as a pure fan of basketball, you have to appreciate and enjoy how amazingly gifted Lebron is. He was unbelievable all season long, even for him. That said, OKC will come back stronger and more experienced. They are a solid shooting guard and a low post presence away from being the next champs. Absotively. Lebron is this generations’ Jordan. I disliked lebron before the decision, but really dislike him for going to miami to create the NWO heat that made impossible for me to enjoy lebatards radio show. Why do i fear that the ban on comments could be returning? If you want my guess: you probably fear it because you see some people drag the name of Joe Paterno into places where it really has no place, solely for the purposes of a) seeking to discredit the author of this blog (although I must confess I fail to understand how that supposedly works) and/or b) raising the dander of those who enjoy the author’s work and come here to read it and discuss it and other matters (or otherwise just like a good chat) without having to read about what somebody thinks the author’s stance on Joe Paterno is and/or means, and knickers get into a twist, and the whole enterprise becomes a lot less enjoyable for everyone, including the author whose blog this is, and you suspect that perhaps he doesn’t see much sense in putting up with the aggravation and might sooner put the enterprise to rest. With LeBron and Miami up. Cuz there, there was no winner’s cup. The endless pity far and wide. How Cleveland’s woes were prophesied. While ol’ Cleveland just waits and waits. Happy he got his championship so this silliness that he’s no good is put to rest. Move on, nothing to see here.